Sunday morning Janet Schumacher and I drove out to Cupsogue Beach County Park on the south shore of Long Island to look for the Hudsonian Godwit that had been reported there since the previous weekend. I first saw it at low tide around 9:15 AM on the first sandbar in the bay, visible from just past the trailer parking area. However the bill looked a little off and I wasn’t sure before the bird took off. 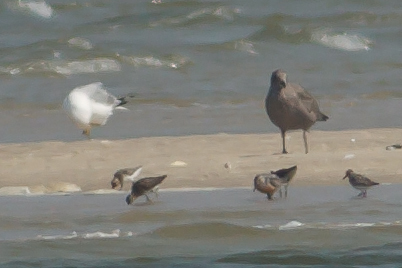 Could have been a Dowitcher in intermediate plumage. Then, after walking a mile out to the point and back again, we relocated it at exactly the same spot and got much better looks at it, including a few (bad) photographs. At least I hope that’s the bird. (Lower right foreground) It was easier to see through the scope which gives you much several times more magnification than my 400mm lens (roughly equivalent to a pair of binoculars). To get this much I had to scan along the sandbar snapping away and then blow up the photos later at home. You are currently browsing the Mokka mit Schlag weblog archives for July, 2010.